Buy through MusicWeb from £7.45 postage paid. CD single available for a limited time. The celebration of John Joubert’s 80th birthday happily prompted a few recordings of his all-too-often overlooked music. All these releases have been reviewed here, and each has fully demonstrated the breadth of this composer’s vision while emphasising the stylistic consistency of his music. This single CD - in itself a Lyrita first - superbly complements the other discs recently released with one of his early major works. The Symphony No.1 Op.20 was completed in 1955 and revised some time later. It is laid out in four movements adhering to the traditional model, with the Scherzo placed third. The first movement opens with a resolute dotted rhythm and a four-note cell, both of which pervade the entire movement. A more sustained melody on strings will also play an important part in this fairly developed movement that ends unresolved with a final rumble from the lower strings. The searing outburst with which the second movement brutally opens disrupts the uneasy, ambiguous mood in the last bars of the first movement. Indeed, the second movement is a rather troubled and intense affair, in which more lyrical, impassioned episodes try to lighten the prevailing tragic mood. The rather nervous Scherzo that follows does not really release the tension of the preceding movements, although there is a quieter episode at its centre. This does not last long, and “the headlong momentum of the Scherzo is soon restored” (the composer’s words). The finale was originally planned as a Rondo with a short slow introduction; but, when revising the score for publication, the composer considerably expanded the introduction, that now occupies about half of the entire Finale. It opens with menacing timpani strokes, much in tune with what has been heard in the preceding movements. This introduces some searingly beautiful music moving at a slow tempo. The conflict is obviously still unresolved. Only with the concluding Allegro does the mood eventually brighten, and the symphony ends in a positive, assertive peroration. Joubert’s First Symphony is a magnificent piece and one of considerable substance and great expressive strength. It displays the still young composer’s confidence and mastery. Admittedly, the music is fairly traditional by mid-20th century standards: “The language bears all the hallmarks both of the tradition I felt I was their heir to and of my then current enthusiasms”. These words by the composer refer to, say, Vaughan Williams who was such an important influence on many composers at that time. In addition I have also been reminded of Rubbra, Alwyn and Walton; none the worse for that. I had not heard Joubert’s First Symphony for a long time, and I had but a faint memory of it. I was thus delighted to make acquaintance again with a fine work of substance that has lingered in obscurity for too long. I hope now that we will not have to wait another ten years to have some of Joubert’s major works available in commercial recordings. 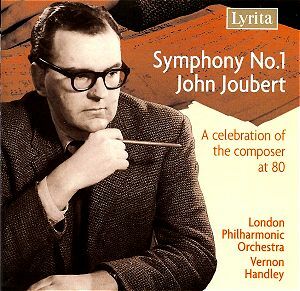 This splendid and heartily committed performance by one of the staunchest champions of British music aptly crowns Joubert’s birthday celebrations.